An escape room is a themed interactive adventure designed to test your problem solving skills and teamwork. You have just 45 minutes to find clues, solve puzzles and progress from stage-to-stage until you escape. Suitable for families, friends, couples, work groups, clubs, special occasions and more. 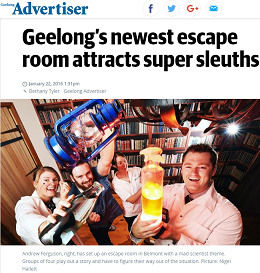 'Escape Room Geelong - The Mad Scientist' opened on 3 December 2015 in Belmont and has had over 2,000+ visitors from local, interstate and international destinations. For availability, session times and to book see our online calendar. Are you a Corporate Team or School Excursion? We have large escape room experinces that can host everyone at once. Want a memorable work function with us? Find out more below. Engage students through Applied Learning. Challenge your Students with an Excursion or Incursion. Instant Delivery - Print or email. Create your own personalised message. You may add more people later if needed. In place of donations we offer the opportunity for you to host a fundraiser event with us, for which we donate a portion of the proceeds back to you. This activity is modified slightly for people with a serious injury, epilepsy, heart condition or who are pregnant. Of note: This activity contains everyday items such as citric juice, food dyes, starch and tonic water. ﻿Who is it meant for? Yes. All persons must be aged 18 or over. Sorry no exceptions. Do you have a Leader Board? We have an escape time Bell Curve so that you can see where your time compares to all others. Do we or the staff have to role play? Can we come back again? Yes. Those who have been before can come again for free when they come back with their friends/family. Is there any blood and gore? We're all about good clean fun and tasteful design. You won't find anything grotesque or unsettling. You are never truly locked inside and you can walk out at any time. Do we have to have our photo taken? No, we only offer this as an optional souvenir and we do not post your times. 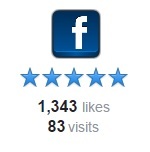 Can we add more people to a booking later on (including vouchers)? Yes. To add more people please contact us prior to arrival. ​Extra people who arrive on the day without notice will not be allowed to participate. No, all our reservations and payments are online by PayPal, Credit or Debit Card or Bank Transfer. Do you do special requests? Yes, just contact us in advance to arrange (eg cake/hidden present/message). Is it hot and stuffy? No. The rooms are air conditioned/heated to maintain a comfortable temperature. I'm Claustrophobic: Is it okay? Sure. There are no tunnels, booths or tight corridors. This escape room is one of the largest in Victoria. Attending as just a pair will also help. Are we in the dark a lot? No, there are no torches and all the stages are well lit. You also have control of the light switches. Yes - we take safety seriously. Will we be grouped with others? No. Your booking reserves the whole room for you and your team. Can I change the number of people attending? Yes provided you notify us prior to your arrival. Can I transfer my booking to others? You may change the people attending as long as the original person who booked remains. Yes. With 48 hours notice or more and you will receive a full refund (or voucher reactivation). Bookings cancelled within 48 hours receive no refund unless at the discretion of management. Yes. They are sold as a two, three, four or five person experience. 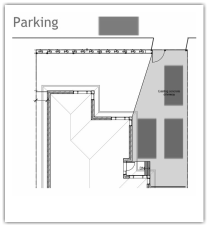 There are three off-street car parks and one on-street car park. No, we only accept people by appointment only. ​We don't receive inquiries or voucher purchases or any other persons on site. Each experience usually takes around one hour. For large groups split into teams we also offer an Express 30 min version. You should arrive 5-10 minutes early but no earlier than 15 minutes prior to your scheduled start time. If you get stuck you may ask for a clue via a radio (we don't assist unless asked). How will you know where we are? Unrecorded surveillance is used to monitor your safety and progress. No. Pictures and recordings are not permitted. Does the experience require any skill or general knowledge? The puzzles are intuitive and do not require any technological, academic or physical expertise. We do recommend bringing reading glasses if you have them. You won't be crawling, jumping or running but you will be active. ​We recommend wearing normal casual wear. Please avoid wearing high heels if possible. Yes - your items can be stored securely inside the escape room with you at all times. Food and drink is not permitted within the escape room. Bottled water is ok.
​Anyone who has an injury, heart condition or is pregnant must let the operator know prior to commencement. No, we apologise for failing to incorporate wheelchair access into our design and will look to do so in future rooms. The entire property is a smoke-free zone. We have a .00 policy for insurance purposes. Anyone suspected of having consumed alcohol will be refused entry. Will we receive a confirmation email? Yes. All the essential information will be sent to you upon confirmation of your booking. ​NOTE: Don't forget to check your junk mail if the email does not appear in your inbox. Sometimes an auto correct or typo error will mean we receive an email address that does not work. If you have not received a confirmation email please contact us. Do we hand out Donations to Clubs or Charities? In place of donations we offer the opportunity for you to host a fundraiser event with us, for which we donate a portion of the proceeds back to you. To find out more click here. 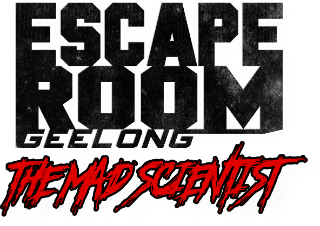 Escape Room Geelong - The Mad Scientist is located at 9 Queen Street Belmont Victoria. We are unable to receive people at our doors without a booking (this includes those people with enquiries or wanting to book). Only those with a booking will be received. The entire property is a no-pets and smoke-free zone. Is the escape room within a residence? 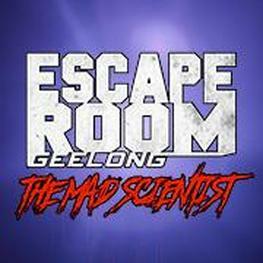 Many businesses such as medical clinics, hair dresser and accountants operate with a residence attached at the rear of the venue and Escape Room Geelong - The Mad Scientist is the same. The entrance to the Escape Room is at the front of the venue so you will not pass through, hear or see the residence at any stage. Yes. Much time and care has been taken to ensure the Escape Room is professional, safe and compliant. The product of a three month construction process with registered tradesmen. 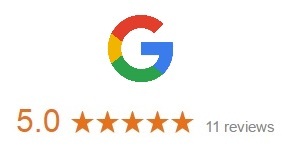 Tried and tested over a four week period prior to open. You can contact us by email at escape@geelongescaperoom.com.au or call 0415 358 346. We welcome enquiries but please note: We don't accept bookings by phone.